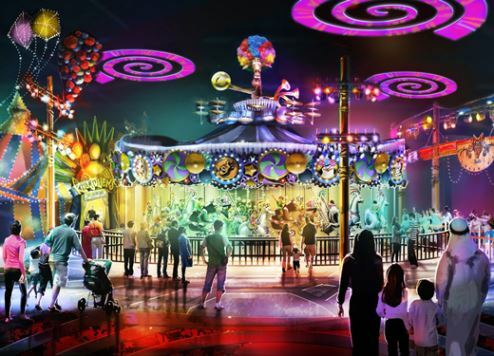 Dubai Parks & Resorts has revealed the latest images of its upcoming theme park, MOTIONGATE Dubai, as the team at parent firm DXB Entertainments PJSC puts the finishing touches to the mega attraction. Action is in full-swing on site at what will be the Middle East’s largest Hollywood-inspired theme park when it opens its doors to the public in December. Details of the park are revealed through a collection of images, lending an exciting sneak peek of what’s coming next month. MOTIONGATE Dubai brings together three of Hollywood’s powerhouse motion picture studios for the first time: DreamWorks Animation, Sony Pictures Studios including the Smurfs, and Lionsgate. Spread across five zones, guests of all ages will be entertained by 27 key rides and attractions including five rollercoasters, multi-media dark rides, interactive play labs, media-based theatre shows, plus a full programme of roaming entertainment and live dance performances. Inspired by 13 of Hollywood’s most-beloved live action and animated films, visitors will be transported into the world of movies including Shrek, Ku Fu Panda, Hotel Transylvania, Ghostbusters, The Smurfs and The Hunger Games. MOTIONGATE Dubai promises a cinematic adventure like no other, bringing some of Hollywood’s biggest blockbusters to life through features and experiences such as the iconic movie reel entrance; the working movie sets of Studio Central; dining under a tornado of meatballs in Baby Brent’s Luncheonette in Sony Pictures Studios Zone; strolling past the charming mushroom-capped houses in the Smurfs Village Zone; and hopping aboard the fastest roller coaster in the park with Madagascar. Visitors can also take in live entertainment at the multi-purpose 1,000-seat Hollywood Theatre, which will play host to action-packed hip hop show Step Up Dubai, All In! With nine family-friendly restaurants, 15 themed retail outlets and multiple kiosks offering light bites and merchandise throughout the park, visitors have a full range of choices for dining, entertainment and relaxation beyond the rides and attractions. As part of its full-service offering, MOTIONGATE Dubai is enhanced with smart technology, smart queuing, shaded walkways and offers full access for visitors with mobility impairments. MOTIONGATE Dubai is part of Dubai Parks and Resorts, the region’s largest multi-themed family entertainment destination, offering more than 100 rides and attractions. One of the destination’s theme parks, LEGOLAND Dubai, has already opened, with LEGOLAND Water Park set to follow on November 15, along with Bollywood Parks Dubai and Lapita Hotel, a Polynesian-themed family resort that’s part of the Marriott Autograph Collection. The entire destination is connected by Riverland Dubai – a retail and dining destination that is already open for business. A fourth theme park, Six Flags Dubai, will open in 2019. Dubai Parks and Resorts is located on Sheikh Zayed Road, opposite Palm Jebel Ali in Dubai and equidistant to Dubai International and Abu Dhabi International airports. It is also close to Dubai’s newest airport, Al Maktoum International – Dubai World Central, as well as the Expo 2020 Dubai site currently under construction in Dubai South.